Good morning! For today's Sunday Brunch, we're discussing eating disorders, recovery, and writing the young adult novel Believarexic with author J.J. Johnson. I write because I have a perplexing, deep-seating need to make stuff up. I get to inhabit different worlds all day, yet still show up and have dinner with my family. Plus it's a rationale for eavesdropping, snooping, and investigating. I get to call it "research." What made you write Believarexic? My editor and I were kicking around ideas for my next novel. I told her I still had all my old journals and letters from when I stayed at an in-patient Eating Disorder Unit (EDU), and I could use them to write a book. I don't think either of us had any idea what it would lead to, or how difficult the process would be. There have been so many books written about characters with eating disorders. What do you hope Believarexic adds to the discussion? First, the name itself points to the fact that eating disorders are about so much more than disordered eating. They are about belief in ourselves and our connections to others. Second, Believarexic is 100 percent focused on recovery, I've seen a lot of young adult novels and memoirs that are much more focused on the illness stage of the disorder; these books subsequently read like how-to manuals for eating disorders. I was very, very careful not to do that with Believarexic. I never mention specific weights—whether diet "target" weights or maintenance ranges, nor do I discuss tricks for purging or restricting food. Additionally, I think the in-patient setting is a fascinating world, and add to that: the 1980s! Who doesn't love the 80s? How do you think eating disorder treatment has changed over the years since you completed treatment? I am not an expert in current methodologies at all, but I do read about treatment approaches for my own curiosity and interest. From what I gather, a lot has changed, but some things are the same. In terms of treatment of adolescents, The Maudsley Approach fascinates me. It keeps restrictive-type eating disorder patients at home, and centers care within the family. This is the diametric opposite of my experience of treatment in the late 1980s. At that time, there was a de-facto assumption that patients were dysfunctionally "enmeshed" with our families—especially our mothers. You have to appreciate the irony. Some things have stayed the same. The emphasis on re-feeding and achieving a healthy weight remains, as does the need for individual and family therapy, good nutrition education, and healthy coping strategies. Music plays such a key role in this book. Was music a type of therapy for you? I wouldn't say that music was therapy for me, but it was important. There's a scene with Nurse Chuck going through my cassette tapes, and that really happened. Songs from that time take me right back, instantly. More generally, I think music is a touchstone during adolescence, more than any other time of life. It was for me, at least. Nurse Ratched was such a despised character in your book. When you look back on her as an adult, what are your feelings? Nurse Ratched is a combination of two nurses from the hospital. One was the head of the unit and actively anorexic (she was hospitalized shortly after I left the hospital). The other nurse was a compulsive cleaner who, for whatever reason, just seemed to hate me. We rubbed each other the wrong way, to put it mildly. Looking back as an adult, I know both these women were human and struggling with their own issues. I hope they got the help they needed. But the thing about a psychiatric hospital is that there is a massive, and crucial, power differential between staff and patients. In my experience, staff can, and sometimes did, use that power to make patients miserable. What what do you know? The thing about being a writer is that there is a massive power differential between a writer and her characters. I get to vilify as much as I want. But you already know the difference. A novel is not a real psychiatric hospital. It's make-believe. No actual humans were mistreated in the writing of this novel. Do you still struggle with your eating disorder? I call myself 99 percent recovered from bulimarexia—and believarexia. At times, I still struggle with body image, but my actual disorder is in healthy remission. I have had relapses, though. I had an acute, but short, relapse my senior year of high school, and another longer relapse when I entered motherhood at age thirty. That one was a doozie. About a year after giving birth, I started purging for the first time in more than a decade. It wasn't every day; the eating disorder had morphed from the violent, intense monster of my teen years into a chronically nagging, niggling critic. It persisted for nearly five years. What made it worse was how entirely unprepared I was for a relapse. I'd thought I was completely done with disordered eating. I wish someone could have warned me. I was disappointed in myself, depressed, and deeply ashamed. I'm pleased—and relieved—to say I'm in good health again, after a few ugly wake-up calls. One of those nasty calls was a messed up esophagus. Due to accumulated years of purging and mistreatment, I now live with strictures and valve issues; sometimes food gets stuck on the way down, and sometimes it even comes right back up. And not because I want it to anymore. Another change in perspective came as a result of two fluke accidents resulting in concussions. Ensuing post-concussion syndrome left me weak, confused, and debilitated for many months. It brought into start relief the absolute blessing that good health is. Are you involved in eating disorder causes? Not formally. For many years, I spoke in high schools, colleges, and with EDU patients about my recovery. In graduate school (where I studied adolescent risk and prevention), I reached out to and learned from some amazing leaders in eating disordered treatment, and subsequently did some work with teens around the issue. And I continually address eating disorder awareness and body honesty in my books, interviews, and public appearances. What are your keys to recovery? A shift in perspective, a supportive safety net of family and friends, a commitment to good health, and no more secrets: these were the foundations on which I re-built my recovery. There's so much more to life than whether my tummy is flabby. My tummy is flabby. It always will be. But you know what else? My heart is full, my brain is functioning, my soul is solid, and my smile still works great. What is your advice for readers who might be struggling with similar disorders? PLEASE GET HELP. If your eating is disordered enough to interfere with the enjoyment of your life, or affecting your relationships, then your eating is disordered enough to need help. The end. Full stop. No arguments. 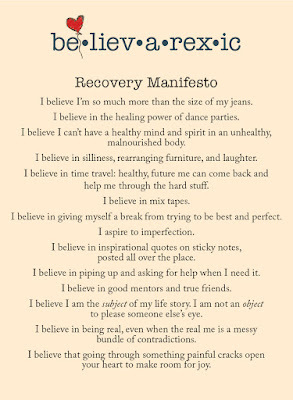 Recovery is possible. It's not easy, but it's worth it. Say something to someone. Write a note. Send an email. Make a phone call. Don't stop reaching out until you get the help you need. Take that leap of faith. Trust that you'll grow wings when you do. I'll be right here cheering for you. Believarexic is now available to buy! 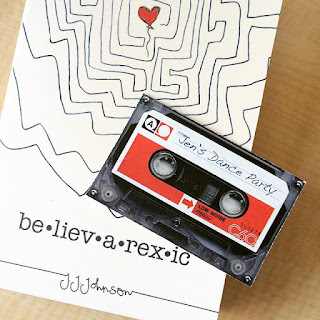 Check out more information about Believarexic here, and more about JJ Johnson on her website. Don't miss our New Book Wednesday post about Believarexic on October 14!